Supermini winner | What Car? We know that Audi can create brilliant sporty cars such as the TT and the R8. We also know that it can create sumptuous interiors such as the one in the new A8. 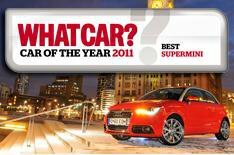 Now the Audi A1 proves that Audi can cram all that expertise into a car thats as affordable as an average city runabout. Its an outstanding achievement. In many ways, the A1 is the best example of downsizing we can think of. Although its Audis cheapest model, theres no sense that corners have been cut. Dont listen to any Oh, its just a Polo in fancy dress doubters. Yes, the two cars share the same underpinnings but, as good as the Polo is, the A1 has a very different feel and comes across as every inch a bespoke premium product. Nowhere is that more evident than in the cabin. From the drivers seat, the A1 does an uncannily good impression of a TT, with a sporty design, perfect driving position and precise, solid controls. Its similarly classy, too, with build quality and materials that put it in a different league from any other supermini on the market. The A1s sporty character shines through the moment you turn the key. Our favourite model the 1.4 TFSI Sport has a fruity but civilised exhaust note that sets the tone for an intoxicating blend of hot hatch-style fun and prestige-brand refinement. Every journey is a hoot, thanks to the A1s agile handling and responsive steering, not to mention a turbocharged 120bhp engine thats remarkably strong and flexible. True, the firmer suspension that comes with the Sport trim means the ride is on the hard side, but when the end result is a car thats this engaging to drive, its a small price to pay. Inside, all is calm, thanks to a smooth engine and a cabin thats quiet at all speeds. Theres space for four people and their luggage, even if rear headroom is rather tight and you do need to travel light. At 15,670, our favourite A1 is great value and makes sound financial sense to run. It has an official average fuel consumption of more than 50mpg and CO2 emissions of just 124g/km, and we expect the A1 will hold its value even better than its arch-rival, the Mini. Surprised? Dont be the A1 is the top of the pile in so many ways.